The Astro-Physics 6" Eagle Folding Pier is a versatile work-of-art as well as a totally practical tool for the advanced imager. The one piece assembly sets up quickly in the field and allows adjustment of pier height, leveling of the mount, and eases the process of polar alignment. Consider this pier for your 400, 600E, Mach1 and Mach2 mounts. The practical height range of the pier is 24" to 36". Adjustment is made by placement of the included extension and by moving the legs in toward the center. Adding the optional 4” or 8" Extension that attaches to the top of the pier gives a total practical height of up to 44". The 6" Eagle is a breeze to set up and adjust. Large comfortable hand knobs make the whole process tool-free! To set up or adjust, simply loosen the 3 Leg Adjustment Knobs to spread the legs apart or fold them in. Move the legs in and out from the 6" Eagle's center column to fine tune the pier's height and to level the assembly if the ground is uneven. Then, re-tighten the knobs. The 6" Eagle's feet articulate to adjust to the terrain. Your mounting will have an additional 30 degrees of azimuth adjustment in the Pier Adapter Slots. This will greatly speed up rough polar alignment! 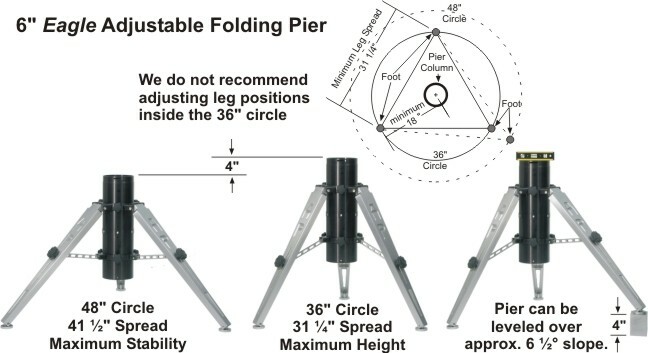 Accessories for your 6” Eagle Folding Pier – Make your DREAM SETUP! Control Box Adapter (CBAPT) for attaching your GTOCP2 or GTOCP3 Control Box directly to your 6"
We have prepared the following guidelines for using accessories with your 6" Eagle and this page with examples of different setups.